The developer acquired 22 Morris & 60 Bridge Street, Woolloowin, a 38,400 square metre site in late 2015 and is proposing a five year staged mixed density residential development with a primary focus on terrace home housing. The Heritage Laundry building and the Heritage Convent building which were built around 1889 will be repurposed into new residential uses that honour the existing architecture of the buildings. A new two and three storey extension is planned for the laundry building to enable minimal building work in the existing building. Designed by Rothelowman, the design is said to allow for vegetated streetscapes and large open spaces adjacent to heritage buildings on the site in order to maximise view lines from Chalk Street to the former laundry building. 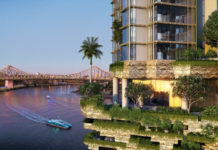 The subject site was put to a competitive tender sale process in 2015 which saw Leighton Properties, Sunland, Mirvac and Consolidated Properties vying for the site. The Sisters of Mercy intend to continue to use a small part of the site and some of the existing buildings fronting Morris Street however they will cease operations and exit the site as they finalise relocation of their facilities to other sites in Brisbane over the next few years. The historic use of the site by the Sisters of Mercy has been discontinued over recent years, with the only uses continuing on the site since 2014 being a number of office administration functions, the remaining nursing care units, and the commercial catering operation known as the Cookery Nook. The development application number for this proposed development is A004465701.